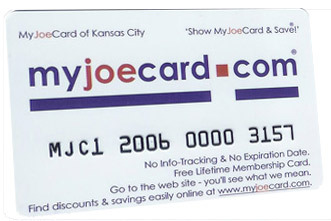 MyJoeCard of Kansas City | Go Green, Shop Local & Save in Kansas City + Digital Marketing. Business Owners: Want to give back to the community? Be a sponsor and help raise funds for Kansas City Metro Area schools, churches, youth groups & non-profit organizations w/ our True 100% Fundraising Program. See more information about becoming a sponsor here.